The most effective competence development methodology is role-based training. 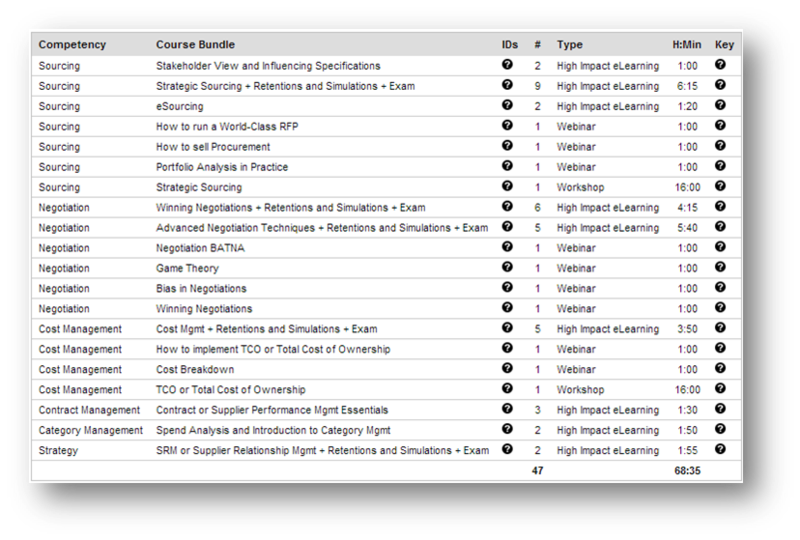 This structured and segmented approach to training, will allow you to train your procurement staff to what is required for their role. Procurement Academy has developed a best-in-class competence model that can easily and quickly be adapted to meet individual customer’s expectations. Together with the customer, our operations team will review and adjust the procurement roles, competencies and required proficiency levels to make sure that they are perfectly aligned with the needs of the customer. No lengthy or expensive consulting track, but a fast and effective process that will allow you to set up a tailored competence model in just a matter of days. Once the competence model has been agreed, Procurement Academy will propose a set of learning plans, one for each procurement role. If needed, these plans can further be adjusted. Courses can be added or removed, and in-company or third party materials can be added to the program. Companies and organizations that do not wish to assign a standard learning plan to all learners performing the same role (e.g. all senior buyers), can opt for individual learning plans, following an in-depth buyer assessment and gap analysis. 2. An online self-appraisal, in which buyers assess their own competencies. The online assessments are particularly effective in large organizations that have a dispersed purchasing team spread over many countries and/or locations but still need to assess and train their people in a structured and consistent manner. 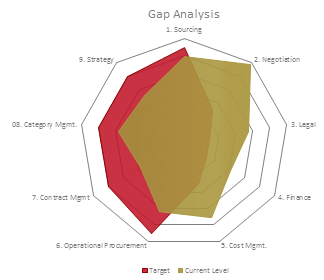 Based on our findings, and your requirements for each position (role) in the company, we develop a gap analysis for each buyer. This will give a clear image of which competences need training, and how much. This skills gap analysis can really benefit an organization by providing a critical overview of the workforce, allowing managers to determine if their employees have the necessary skills to meet organizational objectives. Completing a skills gap analysis allows organizations to stay on top of employee development, channel their resources effectively and adapt to future skills demands.